Product description: Very effective and environmentally friendly fabric cleaner and stain remover for clothes, carpets & upholstery. Fabric Cleaner & Spotter работи чрез отделяне на мръсотията и оцветяването на молекулите, които са се закрепили върху влакната. Това се извършва чрез напръскване на почистващия препарат за тъкани върху мръсната повърхност и оставянето й да подейства. Молекулите в продукта вибрират срещу замърсяващите частици, като ги отделя от влакната, които са оцветени, което им позволява лесно да се избърсват с парче хавлиена кърпа. Това уникално действие на почистване прави продукта напълно безопасен за употреба, без да причинява повреди на повърхността, върху която се нанася; Няма нужда да се търка просто го оставете да подейства. Fabric Cleaner & Spotter е безопасен за околната среда продукт, състоящ се само от растителни екстракти. Това означава, че е абсолютно безопасно да работите във всяко помещение; Вкъщи, на работа, в болници, по дрехи и за много други приложения. Fabric Cleaner & Spotter е идеален за използване върху всички тъкани, включително; Мебели и килими, интериори на автомобили, чанти и аксесоари, обувки и дрехи. Той не съдържа разтворители или абразиви и е абсолютно безопасен за употреба върху всички тъкани и текстилни изделия. Той дори е безопасен за употреба върху деликатни продукти като вълна и коприна. Той ще отстрани или ще намали всички горепосочени петна в рамките на няколко дни след появата на петна. Ако не успее, или за по-стари петна, трябва да използвате един от нашите специални продукти за отстраняване на петна. 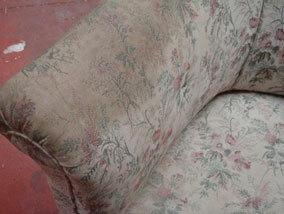 This small Edwardian armchair was re-upholstered in the 1970's and has become very dirty since. The arm is soaked in grease, dirt and grime. We thoroughly cleaned the arm with the Fabric Cleaner & Spotter and then rinsed clean with warm water. 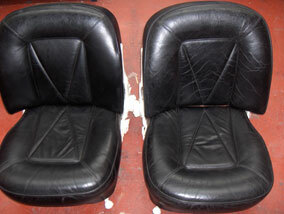 Process: The seats are prepared in the normal way; no repairs are needed as the leather is in mint condition. As this is a drastic colour change (lemon to brown), we sponge 3 base coats on to totally kill the lemon colour and then spray one fine coat of colour on for an even finish. 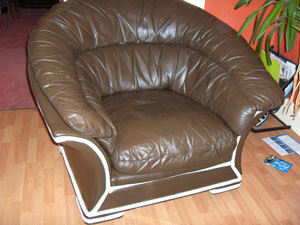 The job is then sealed in with a satin leather finish. 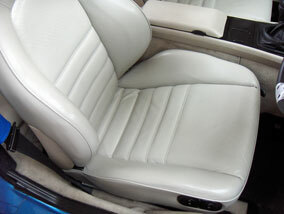 Job: Change colour of leather from blue to dark brown & also change colour of piping from ivory to cream. 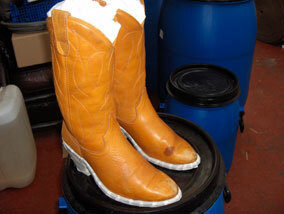 Process:The leather is prepped in the normal way and then alcohol cleaned. Two coats of colour are sponged on to create a good base covering and then a second coat is sprayed on. 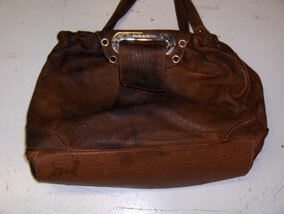 The leather is then sealed and left for 24 hours. All the brown is masked up and then the piping is sprayed cream & sealed. 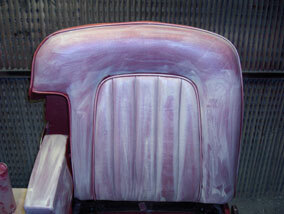 Then the satin finish is sprayed over for the desired shine. Cost: £35 Small Kit + £11.75 250ml cream colourant = £46.75. 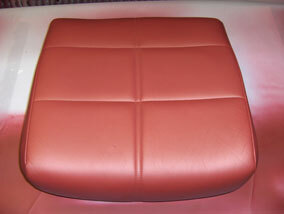 Job: Change the colour of cinema seat to match new decoration. 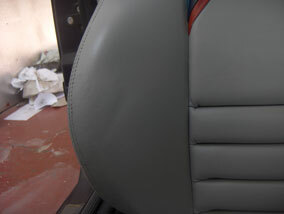 Process: Rub the seats down with the leather prep and abrasive pad to remove cracked areas. Then alcohol clean to make ready for colour. 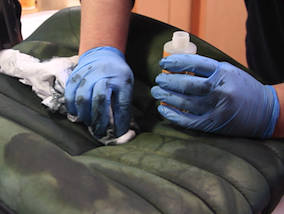 Apply a base coat of colour to work it into any creased leather and then a second coat is applied for a more thorough covering. 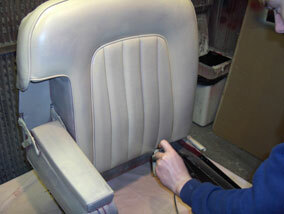 A final coat is then sprayed on with an airbrush for a fine and natural finish. The job is then sealed in and then finished in matt. 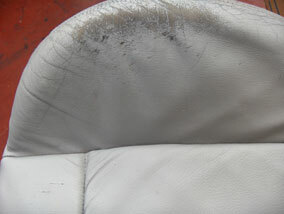 Process: The seats are very badly worn and so, when prepping them, only use a cloth instead of the pad. 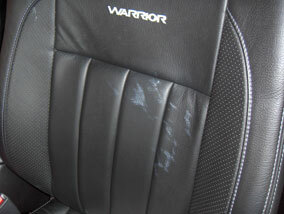 There is no need for the pad as the finish is already removed due to the extent of damage on the seats. 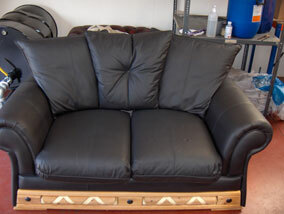 Then alcohol clean the leather. Sand with 600grit sandpaper to make a bit smoother and then spread the heavy filler all over to fill the cracks - sand once dry. Sponge a coat of colour on and then spray a second coat on for a uniform finish. Finally, seal and finish in satin. 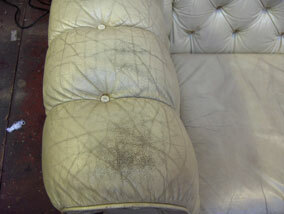 Job: Restore colour and light cracking to two 3 seater chesterfield sofa's. 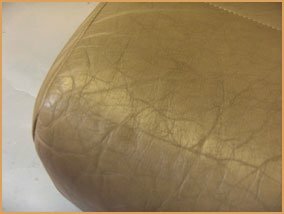 Process: Prep the leather with the abrasive pad and leather prep, this process reduces the crease/cracks on the leathers surface. 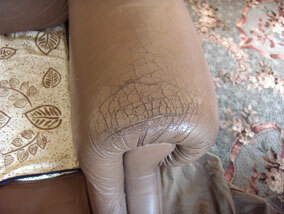 Then alcohol clean the leather to prepare it for colour. Sponge on one coat of colourant and then spray a second coat on for a nice even finish. Finally seal and finish in satin. Cost: £125 Extra Large Kit. colour match is free on this size kit. 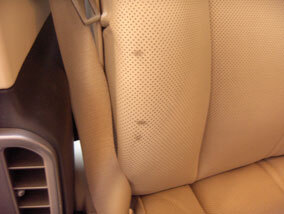 Process: Prep and alcohol clean the seats in the normal way. Sponge on one coat of colour and then spray a second coat on for a nice even finish. Seal and finish in matt. 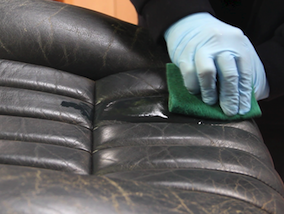 Process: Prep and alcohol clean the seats in the normal way. 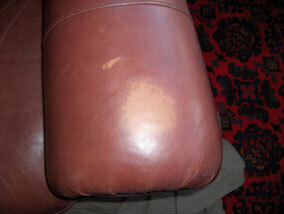 There are a few cuts, which are repaired with the leather repair compound. 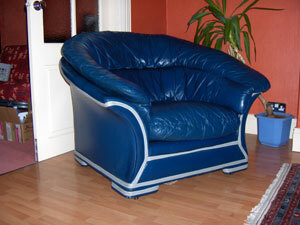 The colour is then sponged and sprayed on followed by a seal coat and then finished in matt. 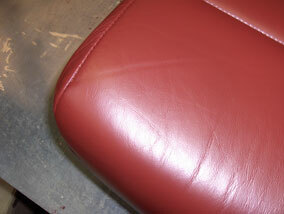 Process: Prep and alcohol clean the leather to reduce the gloss paint stain. 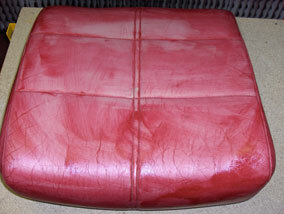 Then sponge and spray the colourant over the gloss paint to hide it and blend it in with the rest of the leather. Finally seal and finish in satin. 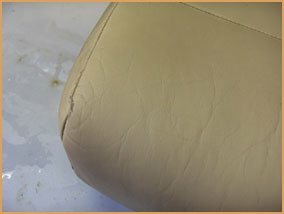 Process: The cracking in this photo is not actually cracking in the leather, but cracking in the painted coating ontop of the leather. 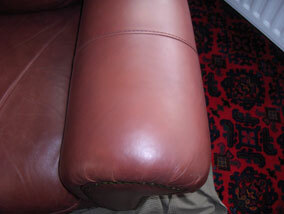 So, by prepping the leather you will mostly remove the cracking, followed by a light sand to make smooth. 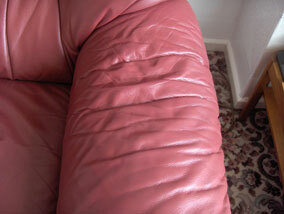 Sponge and spray the colourant onto the leather to blend it in with the rest of the sofa and then seal and finish in satin. Process: Prep and alcohol clean the arm. This will slightly reduce the cracking. 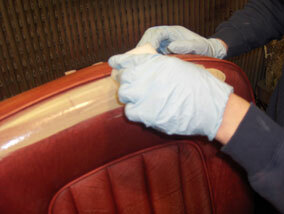 In this case, most of the cracking is in the leather and so we will also need to fill the leather with the flexifil. Spread the repair compound over the cracks and allow to dry. Then sand using 600grit+ sandpaper. As the cracking is quite bad this process may need to be repeated to make it totally smooth. Finally apply the colourant and finish in the normal way. Process: Prep and alcohol clean the light area - this will make the damage worse! 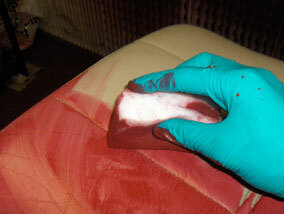 Then spray the colourant lightly over the area to blend it back in with the rest of the arm. When the colour is blended, seal and finish in satin. Process: Prep and alcohol clean the light area - this will make the damage worse! 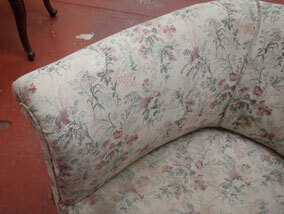 Then spray the colourant lightly over the area to blend it back in with the rest of the cushion. When the colour is blended, seal and finish in satin. 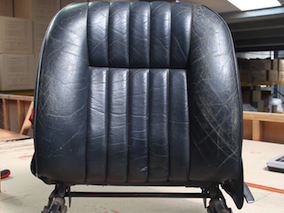 As this is a head area it could have absorbed grease, in this case it hasn't, but if it had it would have been identifiable by a darker patch - to fix that you would need to use the leather degreaser as well. 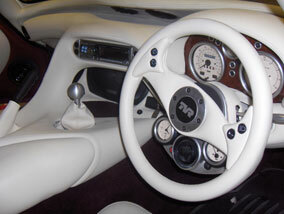 Job: Change the colour of full interior from red to cream. 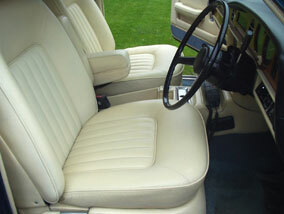 This includes 2 front seats, bench seat, door cards, centre consul, dash and all other bits of leather trim. Kit: Extra Large Colourant Kit (Cream, Matt). 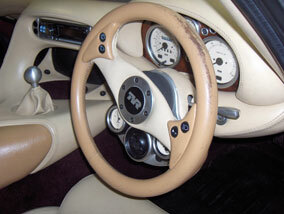 Job: Change the colour of the entire interior from a tan & cream combination to a much paler cream. The full interior is done including front & back seats, steering wheel, centre consul, dash board, roof lining, gear stick & hand break. 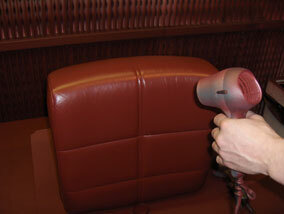 Process: Prepare the seats with the prep & alcohol cleaner. Sponge on 3 coats of colour to get a brilliant base covering, then spray a coat on for a uniform colour. Seal and then finish in matt. 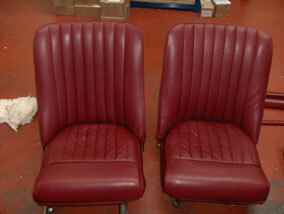 Job: Change the colour of two front seats to match the rest of the interior. 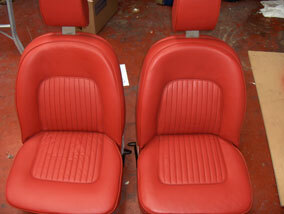 These ivory seats were bought as a replacement for the old red ones, which were a wreck. The colour was changed so that they matched the rest of the interior. Process: Prep & alcohol clean the leather. 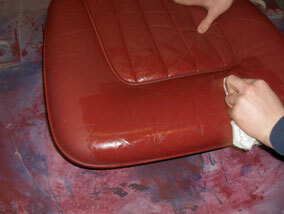 This softens the leather as it removes the hard and brittle top coat. 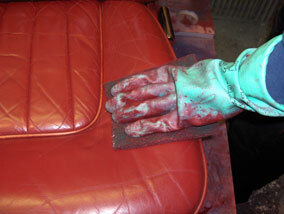 As the colour change is fairly easy, 2 coats of colour are sponged on followed by a third with an airbrush. 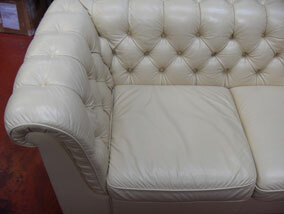 The leather is then sealed and finished in satin. 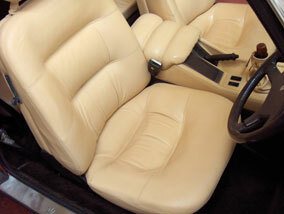 Job: Change the colour of the whole car interior from magnolia to tan. 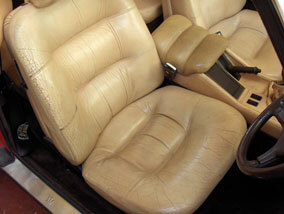 This includes all seats, door cards, dash, leather carpet trim, and all other pieces of leather in the car. Process: Prep & alcohol clean the leather. 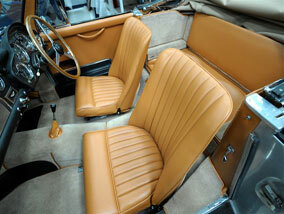 The leather had been re-trimmed and so wasn't in that bad of condition since it is a 50 year old car! Two base coats of colour and two spray on coats were required for an even finish. 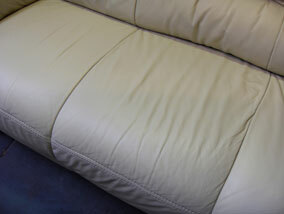 The leather is then sealed and finished in satin. 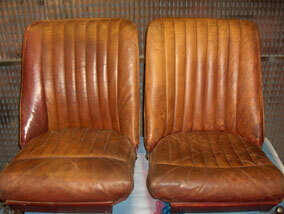 Job: Restored the colour to faded, worn and dirty leather for the two front seats. 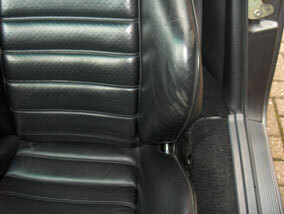 Process: Rub the seats down with the leather prep and abrasive pad to remove cracked areas. 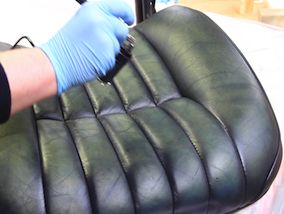 Apply a base coat of colour to work it into any creased leather and then a second coat is applied with an airbrush for a fine and natural finish. 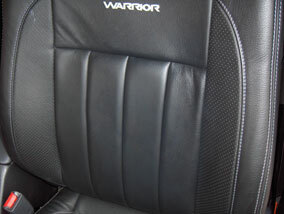 The job is then sealed in with a matt leather finish. 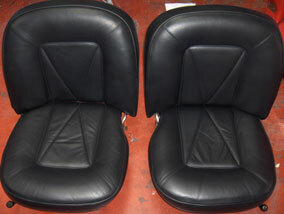 Job: Restore the original leathers colour to the two badly faded front seats, small back seat and the rest of the interior. 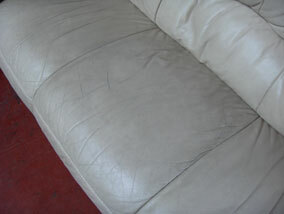 Process: Prep and alcohol clean the leather to prepare the surface for colour. 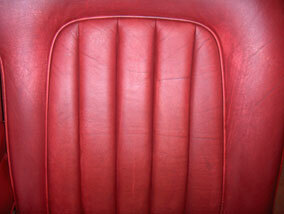 Since these seats are over 50 years old a few cracks need to be filled with the 'heavy filler'. Then the colour is sponged on to act as a base. A second coat is sprayed on for a nice and even finish. 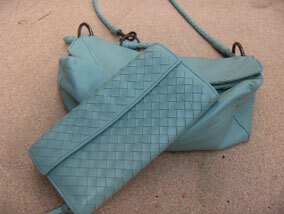 The leather is then sealed and finished. 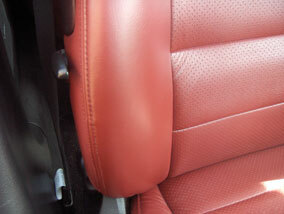 Kit: Extra Large Leather Colourant Kit (AM DB2 maroon, satin) - the full interior was restored. 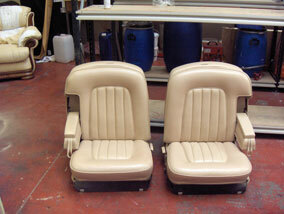 Job: Restore the colour to the two front seats. 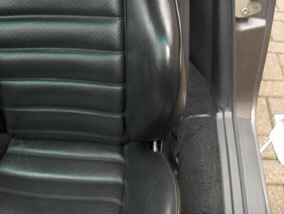 Process: Rub the seats down with the leather prep and abrasive pad to remove cracked and creased areas. 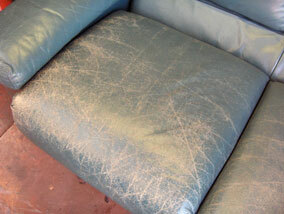 Wipe down with alcohol cleaner to degrease and make ready for colour. Apply 1 sponge coat to act as a base and then spray a second coat on. The final seal is then sprayed on followed by a satin finish. 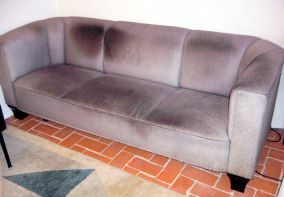 Cost: £55 - no colour matching fee is this is a standard colour. 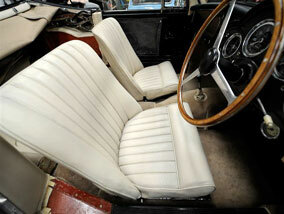 Job: Restore two front car seats, centre console, both door cards and dash board. 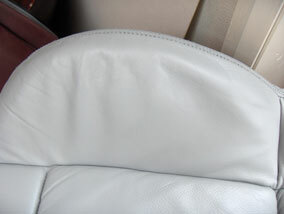 Fixed cracking and general wear on the driver's side bolster. 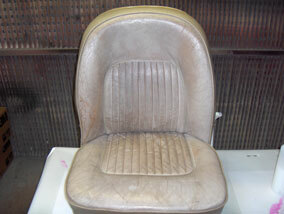 Process: Rub the seats down with the leather prep and abrasive pad to remove cracked areas. 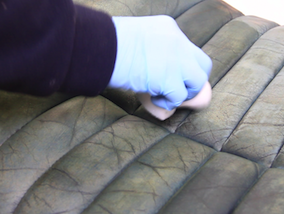 Repair wear on the driver's side bolster using the heavy filler and then restore the colour with a matched colourant kit and satin finish. 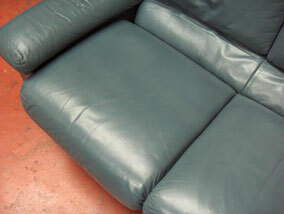 Process: Prep the leather with the abrasive pad to remove light cracking and creases. Alcohol clean to prepare for colour. Sponge one coat of colour on and then spay on a second coat. 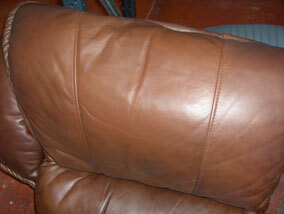 Seal the leather and then spray a satin finish on for a lovely natural shine. 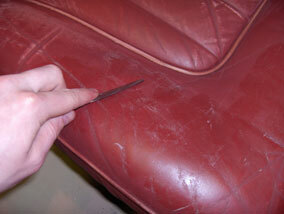 Process: Prep the leather with the abrasive pad to remove light cracking and creases. Alcohol clean to prepare for colour. Spread the heavy filler into cracks and allow to dry, then sand to make smooth. Sponge one coat of colour on and then spay on a second coat. 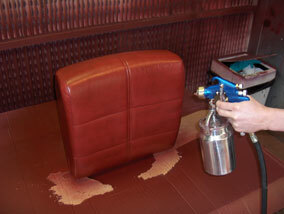 Seal the leather and then spray a satin finish on for a lovely natural shine. 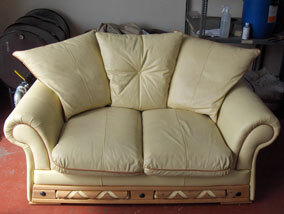 Process: Gently sand the bolster with fine sandpaper (600grit+) then prep & alcohol clean. The sanding will make the leather smooth. Sponge 1 coat of colour on and then spray a second on top to blend the colour in. 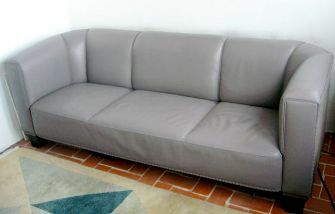 You only need to spray the bolster. Then seal and finish with satin. 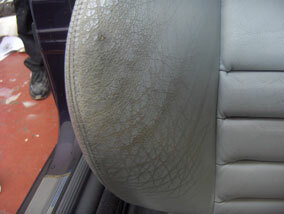 Process: Prep and alcohol clean the leather to reduce the gloss paint. 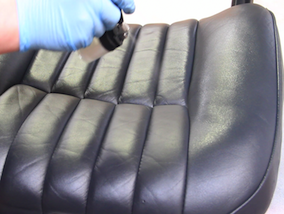 From our experiences it is almost impossible to 100% remove gloss paint from leather, and so, we now spray the black colourant on top of the stain to hide it. 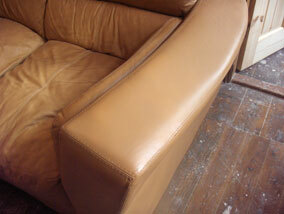 Once the stain is hidden, the leather can then be sealed and finished. 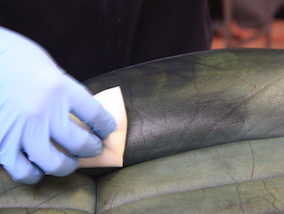 Process: Using 600grit+ sandpaper, gently sand the leather to make smooth. Then prep and alcohol clean. If the surface still feels rough, sand it again. Sponge on 1 coat of colour and then spray a second on top for a uniform and blended finish. Then seal and spray on satin finish. 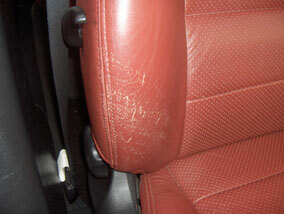 Job: Repair missing colour caused by constant wear & tear from getting in and out of vehicle. 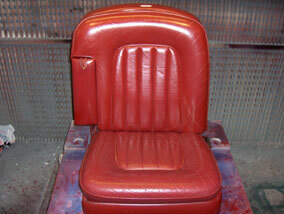 Process: Rub the seats down with the leather prep and alcohol cleaner to make ready for colour. Then sponge on one coat and spray a second coat on for a uniform finish. Seal and finish with a satin spray. 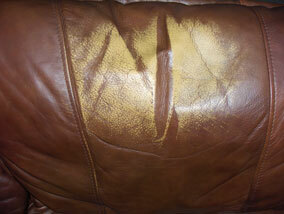 Process: As the damage is minimal, just wipe the leather down with the alcohol cleaner on a cloth. 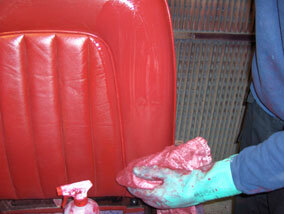 Then spray the colour on - DO NOT sponge it on as this fills the holes. Then seal and finish with matt. 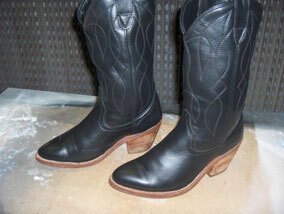 Job: Change the colour of a pair of boots from tan to black. Prep & alcohol clean the leather to prepare the leather for colouring. Then sponge 2 coats of colour onto the leather to act as a base colour and then spray a third coat on for a uniform finish. Finally seal and spray on a satin finish. 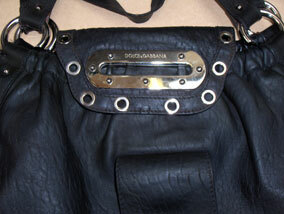 Job: Change the colour of the D&G handbag from brown to black. 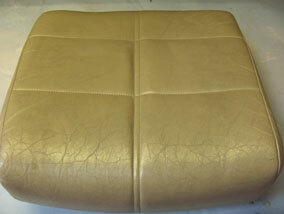 As this is an absorbant and natural type of leather, there is no need to prep the leather as it has no finish to remove. 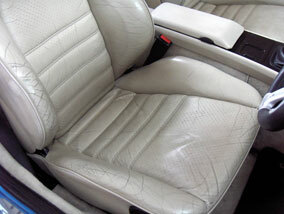 So all that is necessary is to wipe the leather down with the alcohol cleaner. 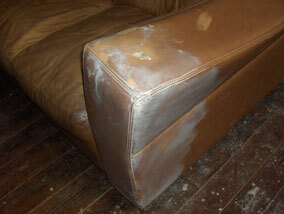 Sponge on 2 coats of colour to act as a base and then spray a third coat on for a natural and even finish. 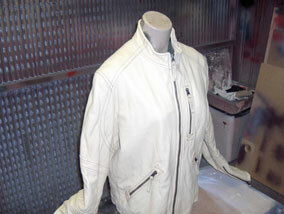 Lastly spray on the sealant coat and finish with satin. 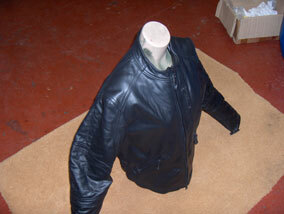 Job: Change the colour of the above armani jacket from cream to black. 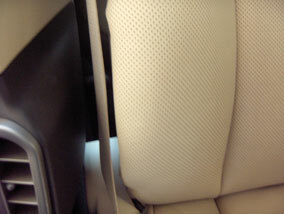 As this is an absorbant and natural type of leather, there is no need to prep the leather as it has no finish to remove. 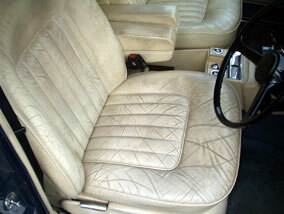 So all that is necessary is to wipe the leather down with the alcohol cleaner. Sponge on 3 coats of colour to act as a base and then spray a third coat on for a natural and even finish. 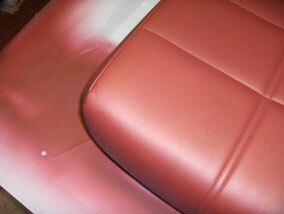 Lastly spray on the sealant coat and finish with satin. 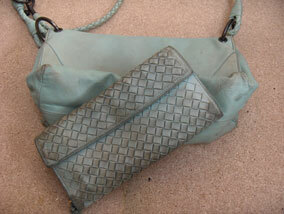 Job: Restore the colour to this bag and purse. 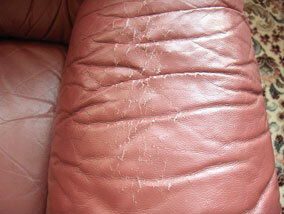 Again, this leather is natural and so we only alcohol clean it. 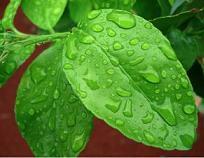 One coat of colour is sponged on followed by a spray on coat. 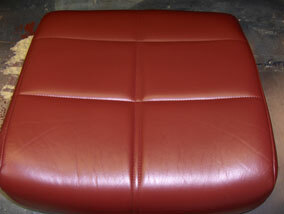 The leather is then finally sealed and finished in matt. Напръскайте върху плата, така че областта леко да се намокри. Разтъркайте тъканта с помощта на четка за дрехи и я оставете да престои 15 минути, докато продуктът отдели мръсотията. Избършете повърхността с парче хавлиена кърпа, за да премахнете мръсотията. Изплакнете почистваната област с топла вода и оставете да изсъхне. Ако тъканта все още е мръсна, продължете да повтаряте тези стъпки, докато не бъде чиста. Оставете тъканта да изсъхне и след това нанесете Fabric Protector за да намалите бъдещото оцветяване и замърсяване. Напръскайте върху петна и разбърквайте с четка за дрехи за 3 минути, след това оставете да престои 15 минути. Леко разтъркайте петното отново за около 3 минути с помощта на четка за дрехи и след това избършете петното с хавлиена кърпа, за да премахнете мръсните частици. Изплакнете обилно с топла вода и чиста кърпа, за да премахнете излишното оцветяване. Оставете тъканта да изсъхне и след това нанесете Fabric Protector, за да намалите бъдещото оцветяване и замърсяване.